In 1986, Burning Man began as a small act of ritualized catharsis among a few friends on San Francisco’s Baker Beach. Thirty-one years later, it’s ballooned into the Instagram-ready juggernaut it is today, and it’s only getting bigger. The festival’s organizing body is meeting with the Bureau of Land Management to discuss the possibility of increasing its size from 68,000 people to 100,000. According to the Reno Gazette Journal, Burning Man is also hoping to close off an additional 500 acres of land for the event, increase the number of art pieces from 330 in 2017 to around 400, expand the number of theme camps from 1,100 in 2017 to 2,000, and raise the number of mutant vehicles from 600 since 2009 to about 1,000. I’m just concerned because, when I moved here 45 years ago, (the Black Rock Desert) was just the most remote, least visited area. That area was so full of solitude, it was a wilderness with a small ‘w’,” said Karen Boeger, a concerned conservationist from Reno who spoke with BLM officials at a public comment hearing this week. 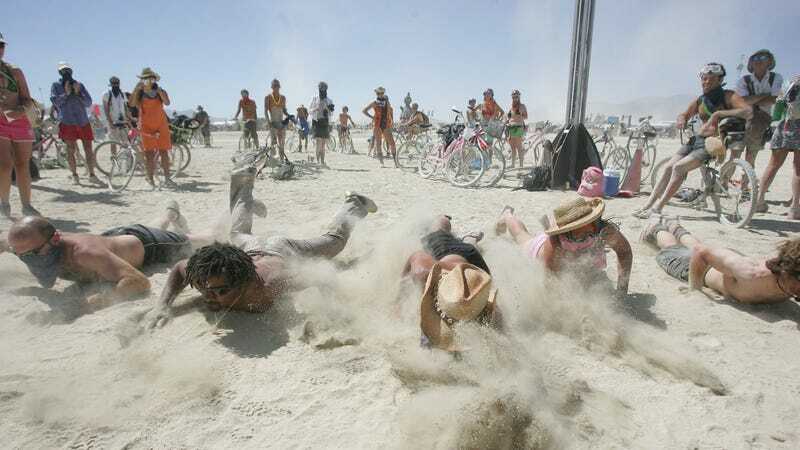 Another under-observed detail is that while the event may haul around $50 million into the state as a whole, the communities actually impacted by Burning Man see only a fraction of that figure. Is such a disparity really in keeping with the spirit of “radical inclusion” on which the tradition was founded? Is paying more than $1,000 to ride a bike around the desert wrapped in Christmas lights? I hope Adrian Grenier is very happy.